Are you the sort of person who gives their dog a Christmas present? Or are you going to a house for Christmas that has a dog and maybe you want to buy something for him/her? 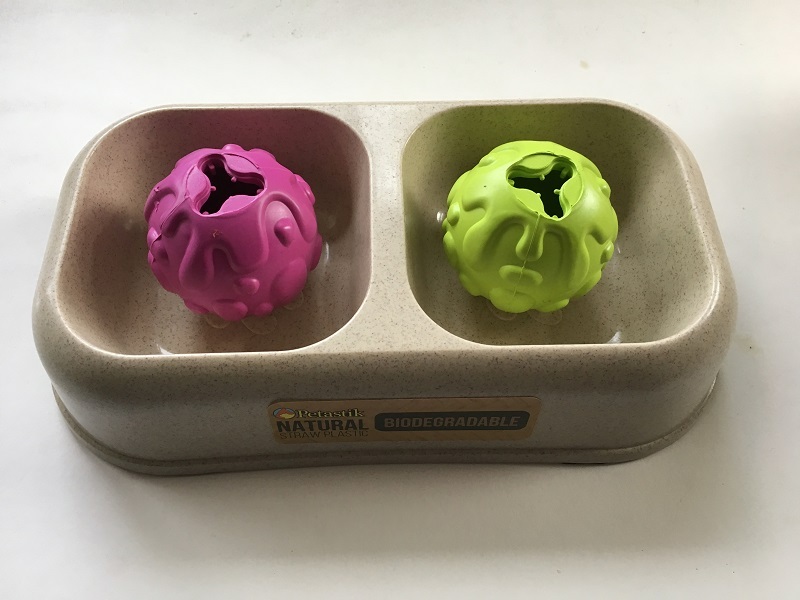 Take a look at this dog treat balls set, and if you want to get your hands on one then fill in the Rafflecopter below. 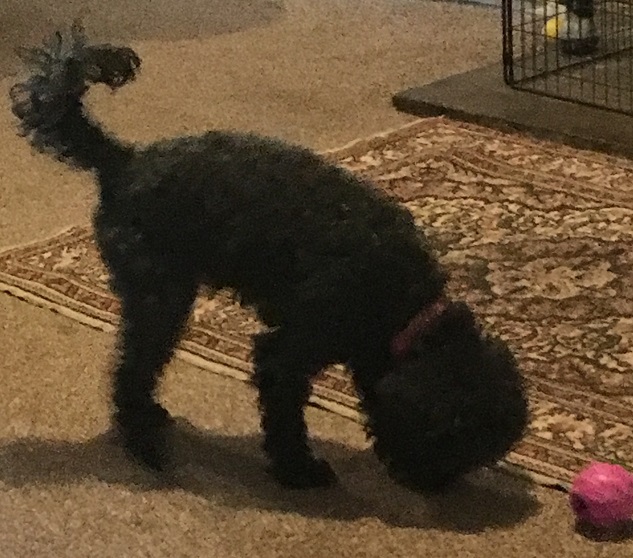 In the way of all dogs, they are (mostly) good boys, but as they live with someone who is deskbound for the majority of the day, they do occasionally need a bit of stimulation, otherwise they will often go and find something to chew that I don’t want them to. I do take them out for walks, but we also need to have little play sessions too. 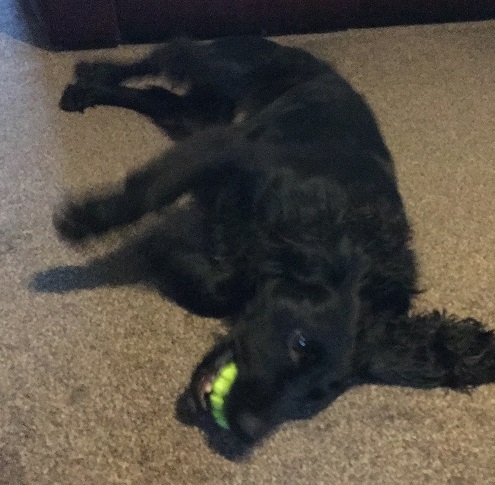 I have quite often given them chewy toys -sometimes they last reasonably well and sometimes they get destroyed very quickly, particularly the ones marked ‘indestructible.’ My spaniel Sirius in particular, likes to chew to the point of destruction. 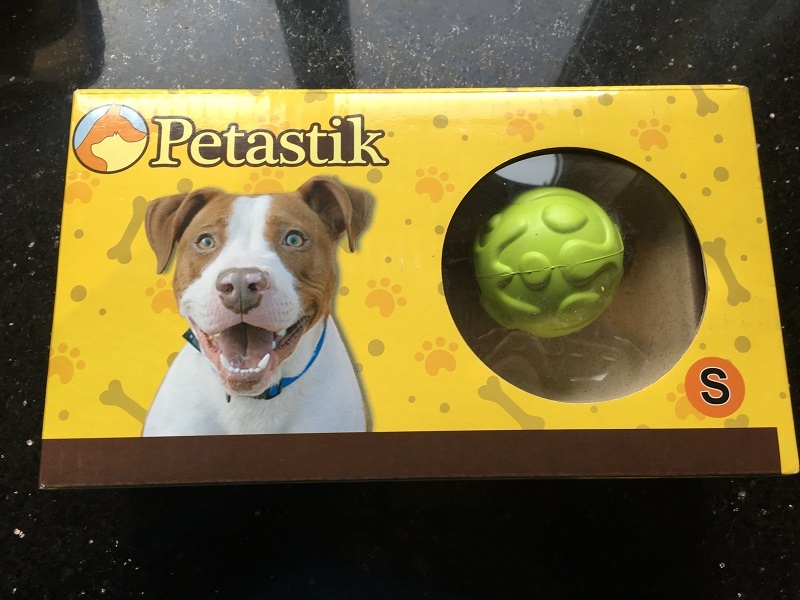 So when the guys from Petastik contacted me about this set, I will admit I was intrigued but not hopeful that these dog treat balls would last more than 5 minutes. I’ll be honest the writing on the back could have been better translated, which didn’t add to my hope, but I persevered. Inside the packet you get two treat balls and a cute little two compartment bowl. 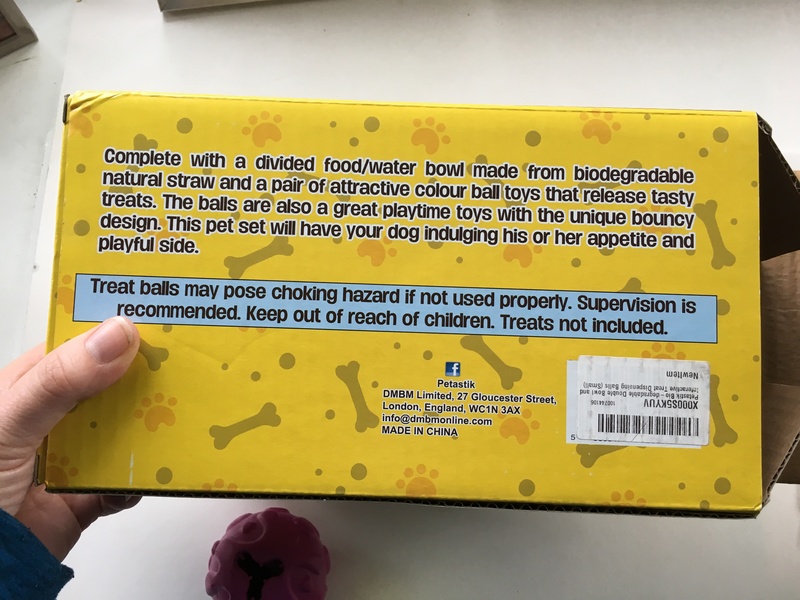 My first thoughts were that the bowl was a bit small for dogs, and also a bit of an odd thing to mix in a pack with treat balls – after all I still have the bowls I bought when the dogs were puppies, whereas I probably have bought over 50 chew toys over the last few years. 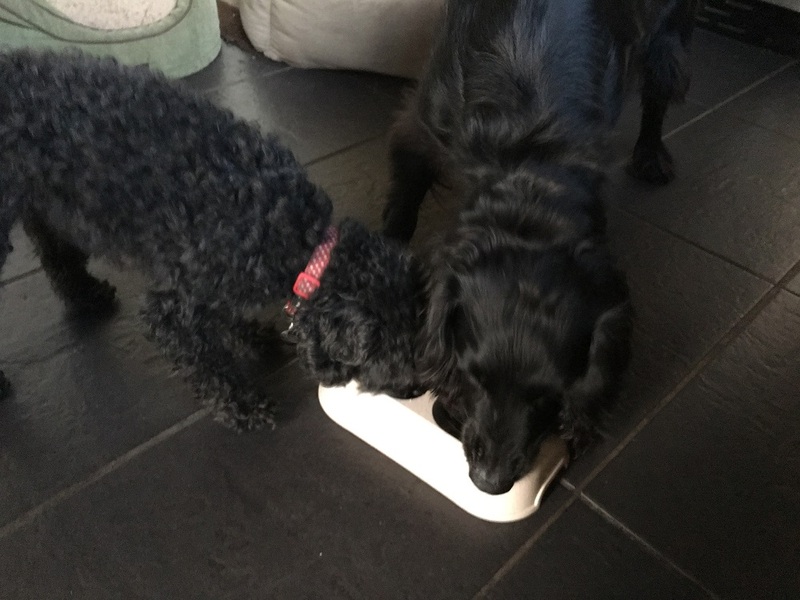 But then I thought again – first of all this would make a lovely travelling water bowl for my 2 in the car, or secondly I could use this bowl specifically for giving them little treat rewards at the end of playtime or training. So then on to the balls. 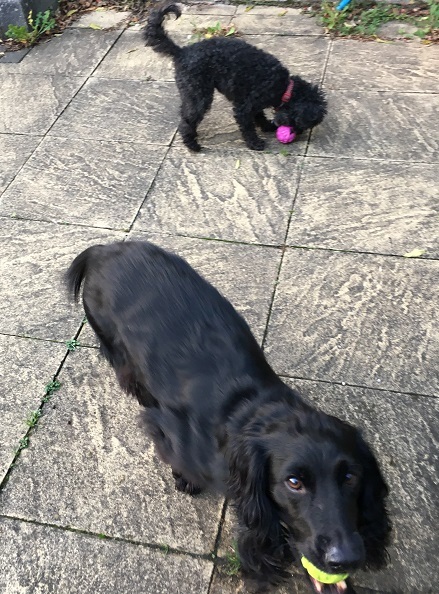 I had a bit of trouble at first as I filled the balls with Sirius the spaniel’s normal food, and it was too large for either of the dogs to get it out of the hole. Even I had a lot of trouble removing it again once I realised what the problem was. So I filled them instead with some of Sykes the poodle’s dried food, gave the treat balls to the dogs and they were off. 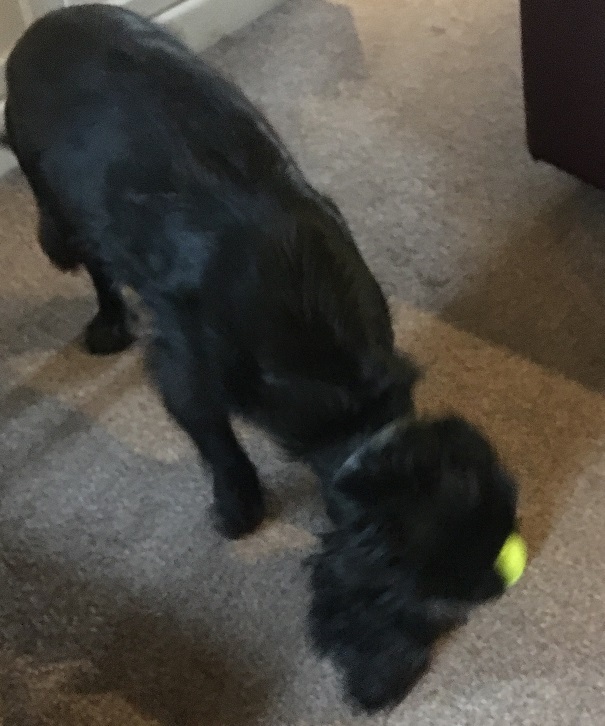 Sirius got quite excited by the ball, and realised that one of the ways to extract treats from it was to crunch the ball hard so that the food inside got smaller and would come out of the hole. Sykes preferred the chase it round the room approach which also worked well. I was surprised at how well the balls lasted. The dogs were entranced with them for about 10-15 minutes and I ended up taking them away, thankfully still in one piece. Then I gave the dogs another treat using the new treat bowl. So, overall I’m completely impressed. 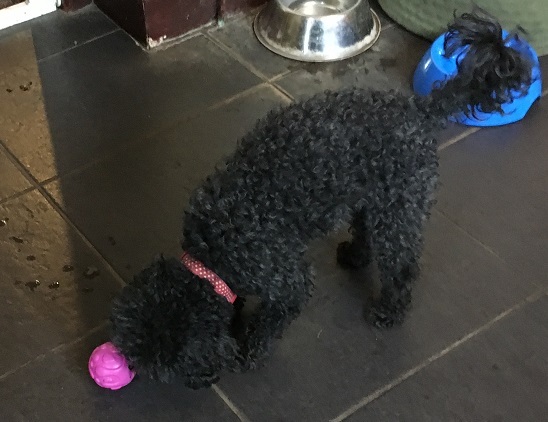 The balls are lovely, brightly coloured so you can find them in the garden and more durable than I expected and the bowl is quite useful too. 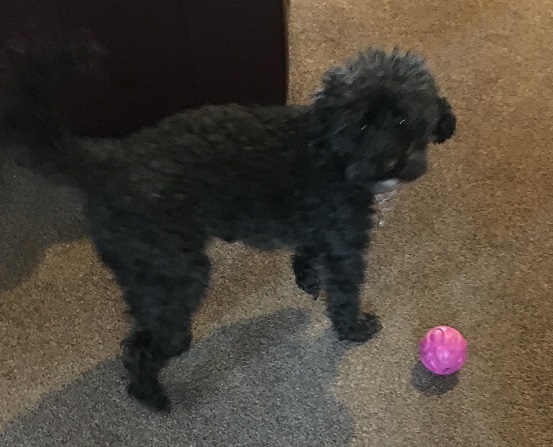 The set I reviewed was the small set, and I certainly wouldn’t recommend these balls for a dog much larger or more powerful than a working cocker (Siri is about 17kg), but used in a supervised way he didn’t completely trash them. There is a set for larger dogs too but I’m not sure how big those balls are. If you would like to receive a Dog Treat Balls set from Petastik, then please fill in the Rafflecopter below. Lovely prize. My dog would love this. Good luck to all. My little cream and white long coat chihuahua, Angel, deserves this prize as she is always so well behaved and she is so loyal and loving towards all members of our family! My boy Boston, aka Boss, would love to win this prize, he is [p]awesome in every single way! my dog is called Stanley and he is a Cavaliar King Charles Spaniel. He is such a daft dog but he is a massive part of our family. He always has to be up close cuddling you. My dog is called New Year as he was rescued on the street on New Year’s Day in a terrible state. He deserves treats today and every day. Joey is a good dog because if ever I cry he licks my hand and makes me feel better, and he loves to play treasure hunt with carrot slices which is extremely cute to watch as he snuffles them out. I’d love this for my bestie’s dog eddie, who’s cuddly and sweet and doesn’t mind that I always smell of cat lol!! My Mums lovely boston Terriers Peggy and Cilla, who are soooo sweet and fun, I love them! Comment All by Basset Hounds are happy and Friendly and smell a lot. 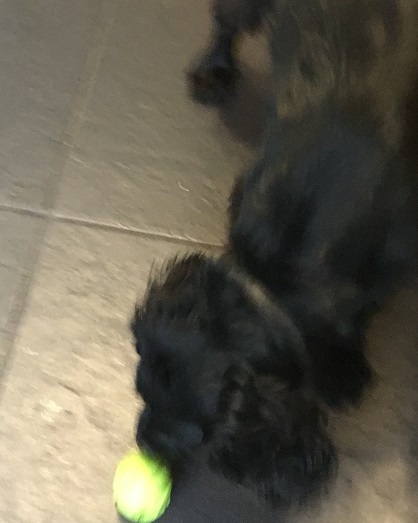 We have a puppy called Zeus – he’s 16 weeks old and is getting bored during the day. I think this would really help with his boredom and would also be a good reward after some training. My dog is a 7 year old Kooikerhondje, and she has been an absolute star this year dealing with a lack of exercise and disrupted routine thanks to my mum breaking her neck…she didn’t climb the walls and cause even more chaos! I’d give this to my springer spaniel as he lives for his ball and always loves a new one. I would probably donate this. I have 3 basset hounds Lucille. Vincent & matilda who would love some new toys! I would give this to my friends puppy dog Max as i think he would enjoy this treat. 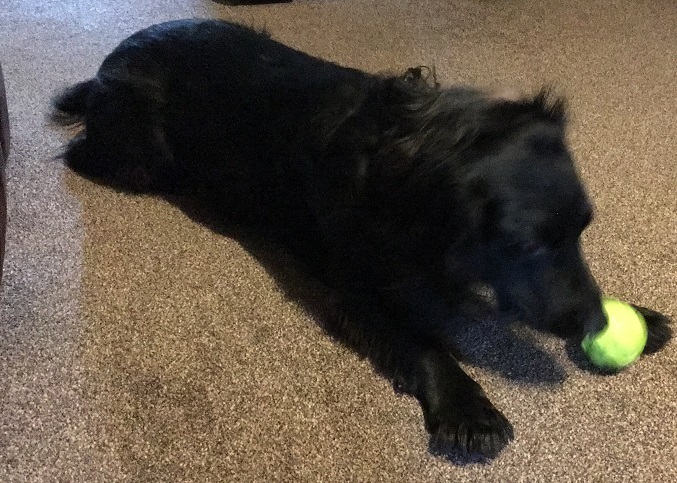 We are puppy walkers for Guide Dogs and although they are not allowed to play with ordinary balls, balls that dispense treats are classed as enrichment and are allowed. The puppies are full of beans and mischief and anything that keeps them busy are always a very good idea! I’ve a bearded collie, Dora, and two bichons Mabel and Merry. 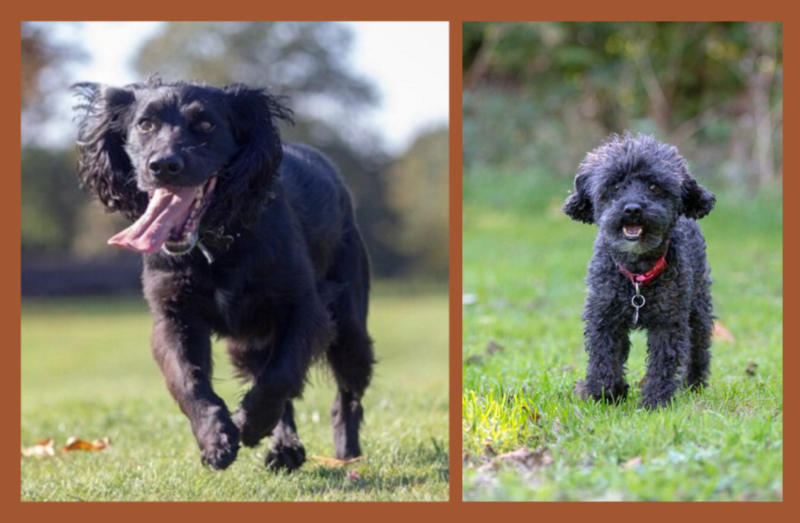 They are mainly good, they love people and other animals and we go to agility (they are proficient, I’m dire!) When freshly bathed and groomed people say how lovely they look but they are definitely dogs not fashion accessories because at the first opportunity they are digging holes, swimming in muddy rivers and rolling in unmentionable things. They’ve also managed to do me more good than 20 years of antidepressants,therapy and hospital admissions. The day one of them managed to steal my psychiatrists sandwiches from his briefcase and eat them, complete with wrapping, was not one of their better days though! I would give it to our new family addition our dag Bodhi, because he has been having training the last 5 weeks and has done amazing! 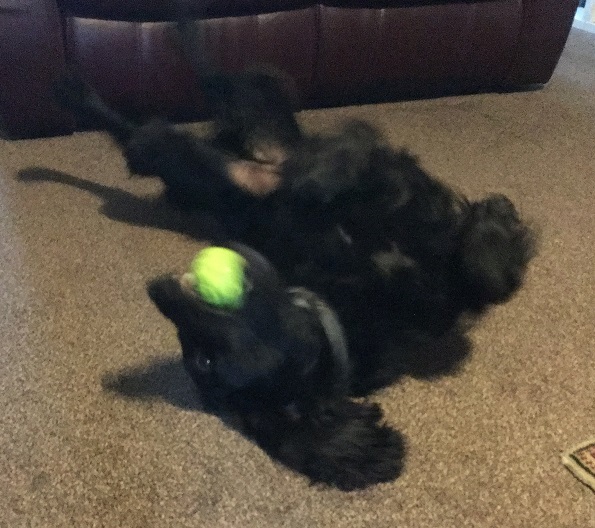 Teal is my black working cocker spaniel. She is very good at hiding shoes and socks and also chewing holes in gloves. She is also very good at giving big lick and cuddles. This would be for my granddog Harley who is such a good dog and loves coming to stay with us. He behaves so well and knows the routine in our house so he fits in beautifully. My rescue Nubie she has come a long way since she was rescued she gives cuddles and kisses to everyone who wants one (including the postman) has helped a few people overcome their fear of dogs and comes to work with me. To think she was once a nervous terrified scrap of a thing! Lottie would love this, she loves exploring new toys! My puppies Benji and Milo are both amazing! We are looking forward to Christmas with two pups this year. 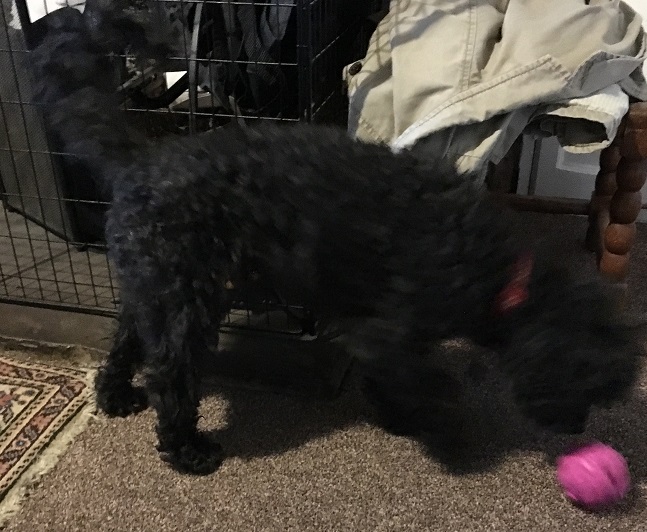 Ollie our Std Poodle pup loves playing with toys and balls and he is such a loving, good natured doggie he deserves a treat! I’d give to my dog Boo who is a lively 1 year old who keeps me amused and brightens my every day.